Indoor sown seeds will be growing happily and it won’t be long before they take their place in the borders. You can be planting summer flowering bulbs in beds, borders and containers in between the inevitable weeding to be done. Tie in climbing and rambling roses and loosen off tree ties so they are not cutting into the wood. Tie in as well clematis and honeysuckle. Roses will be hungry so give them and your shrubs a good feed and apply mulch around perennials, young trees and shrubs to help retain moisture come the hotter months. If you have a fig tree that could probably do with pruning and citrus plants will also enjoy a feed. 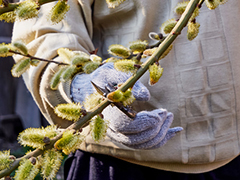 April is a lovely month to be in the garden with much to do and much to admire in the fruits of your labours.